The Crate collections, Oh Darling and Notes & Things, find a home on two Crate Life spreads created by CP Designer, Anabelle O'Malley. After a busy month, she had lots to share! I have to admit it. Notes and Things is officially my all time favorite Crate Paper collection. The colors, motifs, and designs are fabulous. I think my favorite thing about this line is that you can use it for almost anything! This month, I decided to use Notes and Things for some Project Life spreads. I use 6 x 8 albums to house my PL layouts. Usually, I can create one spread for each week. But, the first week of August was eventful for me, so I ended up creating two. Here is the first. 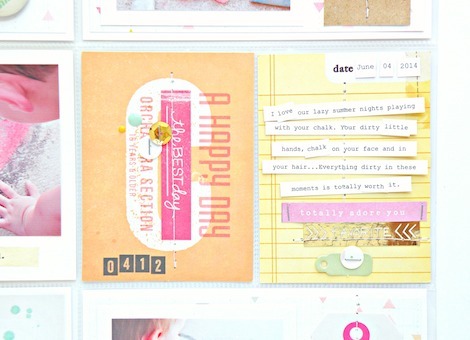 I love the pink and gold that is so prominent in this collection and decided to focus my page using those colors. Since the colors in my photos would have completely clashed, I converted them to black and white. I love the way everything tied together. 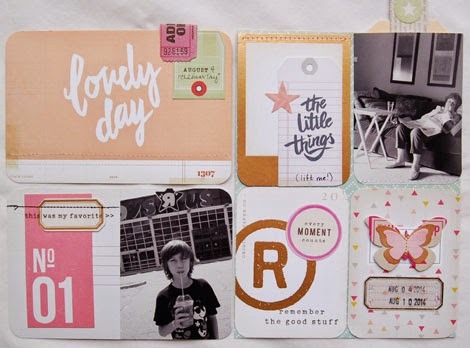 I often use tags that are tucked behind photos for my journaling, since my space is somewhat limited on my pages. Here I used a tag from the die cut set and had plenty of space for everything I wanted to say. 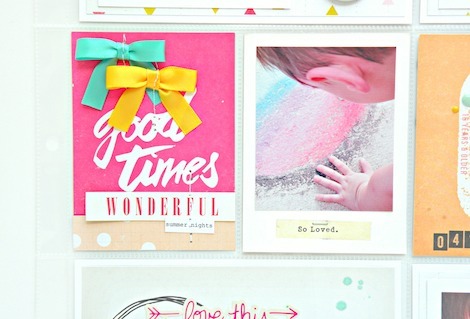 Since I like my pages to look pretty and coordinated, I often layer cards over top of some of my photos. I chose to use a picture of my son right after he'd cleaned up his video game closet. It was a pretty busy photo, so I stitched a card to it and embellished the card with a little tag that reads 'lift me'. This way I can include my memory, yet keep the page looking nice. My next spread for the week focuses on a trip I took to see a friend from high school. She lives in my hometown, which I only get to visit once a year or so. Going back is always so bittersweet. I really wanted to have enough room to document these couple of days, so I started off with two full 6 x 8 pages. On the left, I placed a photo of me with my friend. The Notes and Things die cuts and stand out stickers were perfect for layering with the picture. On the opposite page, I journaled about all of the fun things we did during our time there. Since we had done so much, using the whole page gave me the chance to describe it all in detail. 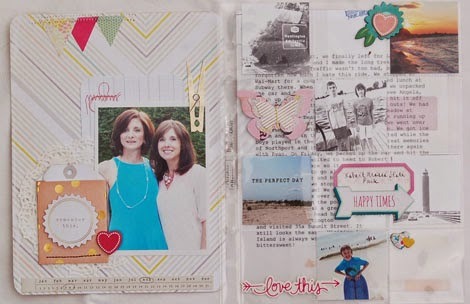 I wanted to include a lot of photos, so I chose to use a page protector with 2 x 2 inch squares. I was able to fill it up with some of my favorite pictures and embellished it with stickers from Notes and Things, as well as a few chipboard pieces from the Oh Darling line. Once layered all together, the spread is a wonderful keepsake for a very special few days that we spent on Long Island. 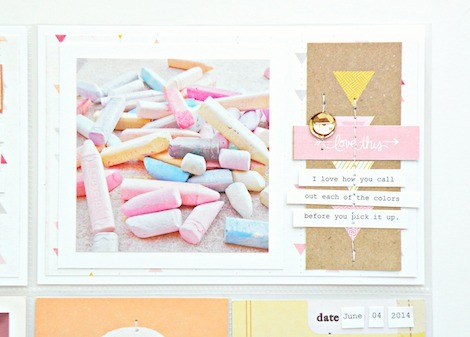 As you can see, the Notes and Things collection is perfect for creating Project Life Spreads. It is certainly one line I will be coming back to over and over again. Thanks for stopping by today! Tomorrow, August 20th, we have some very exciting news to reveal–a brand new, fresh-off-the-press Maggie Holmes collection! It's typical 'Maggie' style, but with a hint of Fall season flavor, gold galore and plenty of shimmering sparkle. Chime in tomorrow for the full scoop and a must-not-miss giveaway! 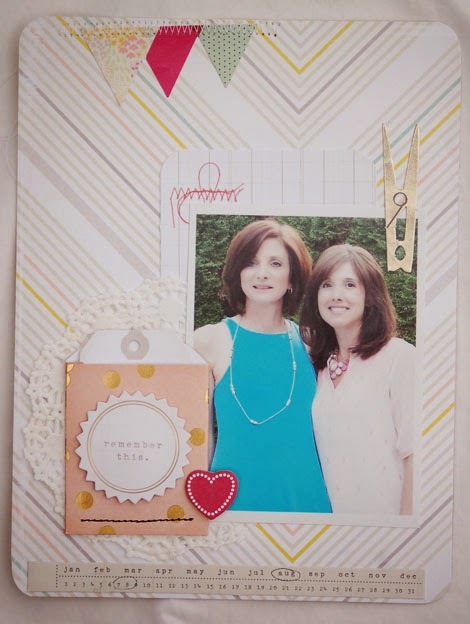 Here's a final farewell 'Back-to-School' project idea from CP Gal, Katie Ehmann. We have a fresh line-up of projects and post themes reflecting CP's latest collection, Notes & Things, starting Friday, August 22nd. I have to admit, the last thing I'm looking forward to is the end of Summer and going back to school! In order to make the transition a little easier, however, I decided to create a fun project for my oldest daughter to use this year to keep herself a little more organized–a fun To Do List! It only took me ten minutes to create this cute 8" x 8" shadowbox frame with Oh Darling patterned papers, bow garland, a stand-out sticker accent, and Thickers from Open Road. I simply cut two strips of patterned paper, machine sewed them to my 8" x 8" trimmed background, stapled the garland, added my Thickers and finally, the doll stand-out. Then, I placed it all inside the frame. Now, each day I can write her 'To Do' list in dry erase marker on the glass frame. It easily wipes away with a paper towel. 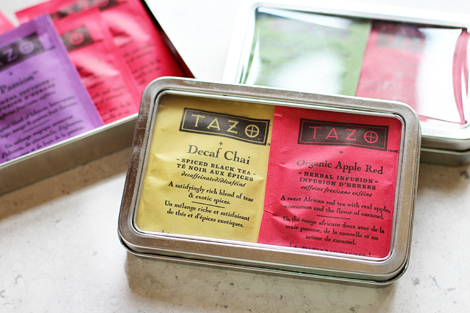 Here is a simple back to school gift idea for teachers–a reusable metal tin filled with flavored tea bags customized and decorated using some fabulous Crate Paper products! I found these adorable metal tins at my local craft store. They had many different sizes and shapes available, but I chose these in particular because they had a clear plastic top. 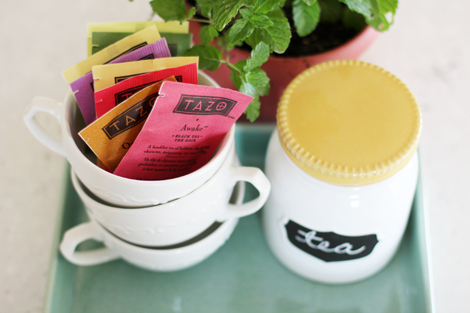 I placed an assortment of different flavors of tea inside the tins which can be reused for storing small desktop items or more tea! I embellished three tins, one for each of my children to give to their teachers, by trimming pieces of patterned paper to the size of the front of the tins. Next, I layered a contrasting piece of paper on top of the first piece, sizing it a bit smaller so that the patterns of both pieces could be seen. Then I stitched them together using my sewing machine. I adhered the paper to the tins using an adhesive tape runner and embellished the front using items from the Boys Rule and Oh Darling collections such as stickers, die cut pieces, and alphas. 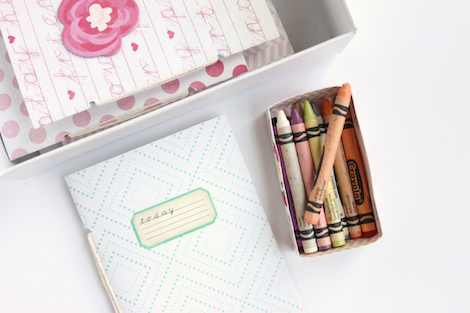 This simple and easy teacher gift is perfect for starting the new school year off right! Who doesn't love a nice cup of hot tea after a long day? These tea tins could be handy for any small gift idea and are great for storing other small items. 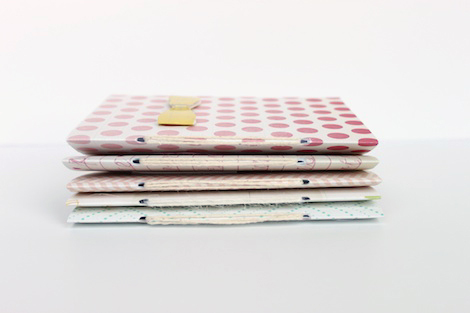 This adorable, personalized notebook from CP Gal, Marie Lottermoser, is an absolute must no matter the subject! And making one is easy - see for yourself! It's that time of year for buying back-to-school supplies. Today, I'm showing you a fun way to personalize a notebook for your kids for the new school year. 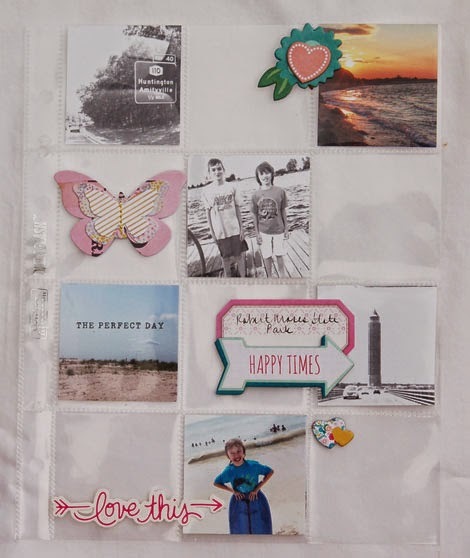 You can make this custom binder in no time with just a couple of easy steps. 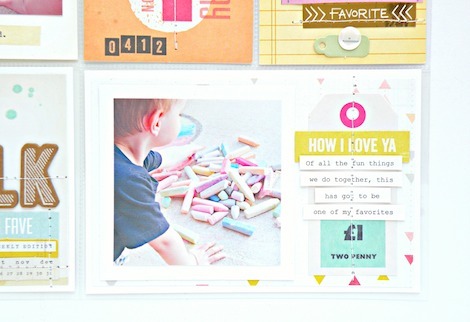 All you need is a tab punch, a paper trimmer, and some pretty sheets of patterned paper. Simply punch out your tabs and label them with different school subjects. I used the Oh Darling collection for this notebook. Next, create divider pages for each section of your notebook. Cut down patterned paper to size (in my notebook, they are 8" x 10.5"). Then attach the tabs directly to the dividers, staggering them as you go. You can attach the tabs with tape, glue or staples. To add some color, I used different patterns of paper for each divider page. You could also place reference materials on each class divider, for instance placing a periodic table on your science divider. 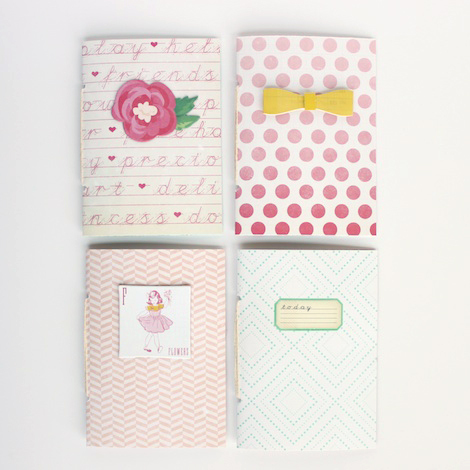 These custom notebooks will definitely help get your kids in the groove to head back to school. It can be a lot of fun to treat a new child to a special gift upon the arrival of the first day of school. These sweet little CP back packs from Ashley Cannon Newell make for a perfect spot to tuck away a surprise gift for a student, or teacher! The school bell will soon be ringing for many students (if not already). So, I've prepared some back to school back pack gift boxes that parents, fellow students, teachers, or other education professionals can use. I made a couple of gift boxes - one for a boy and the other for a girl - to hold back to school supplies. 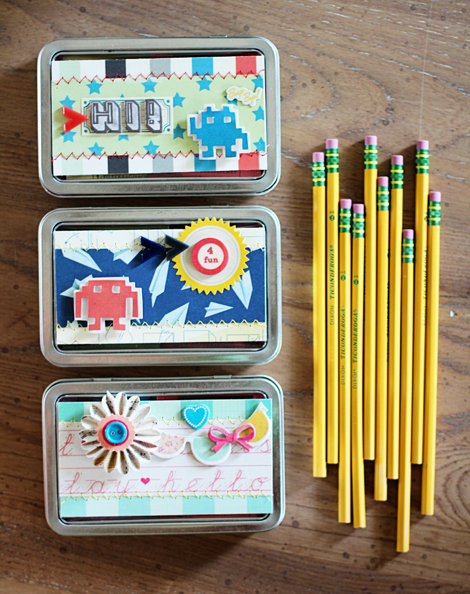 But, you can also use these boxes as teacher gifts to hold a gift card or other goodies too. - Measure all your paper to fit the box front, sides, and back and top flap. Cut flap by using a die as a stencil for a decorative edge. - Remove the top of the box with scissors. 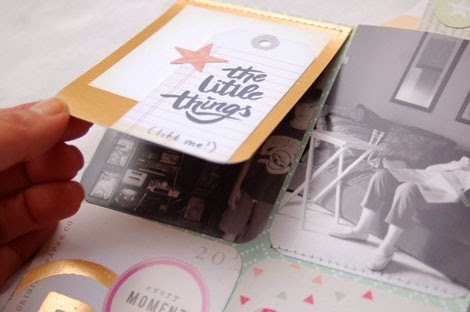 - Score patterned paper pieces that will wrap around the box. 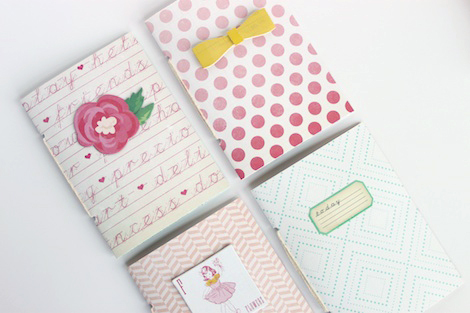 - Cover box with patterned paper. Start with the sides, then cover the front and back. - Add velcro behind the flap to have a secure closure. On the boy gift box, I used the Boys Rule collection. I love how the 'Attaboy' patterned paper couples so well with the 'Pow' paper. I added the wood embellishment as a focal point and the stars for decoration. 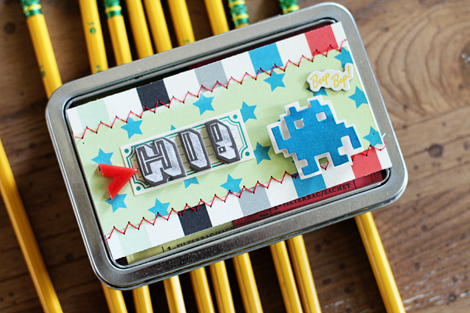 These cute boxes can also be used year round as a reward for kids. If they score a good grade or get into an organization, this would be a great way to say "congratulations!" Here is a view of the back. The straps are simply two pieces of cardstock. I love how the checkerboard pattern in the 'Cool Kid' paper contrasts with the pop of red. Here is a peek at the top of the box opened. I cut a piece of velcro and adhered it to the box and the box top. I filled my boxes with an eraser, glue stick, box of crayons, and a notepad. I also made a girly version. The femininity in the Oh Darling collection is perfect for the darling student. I used a die to trace the shape and hand cut in order to get the decorative edge on the box top. I used Skinny Taste's stevia box, but you can use any box you may have sitting around your home that could be upcycled. 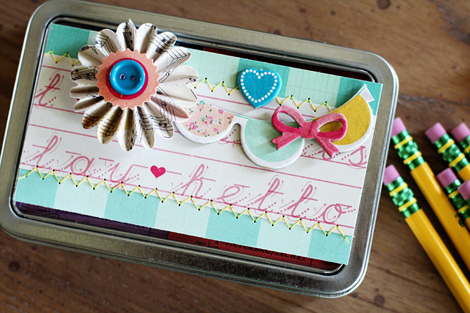 You can also create your own box from cardstock too. On the back of the girl's back pack gift box, I used patterned paper for the straps and love how you can two patterns. 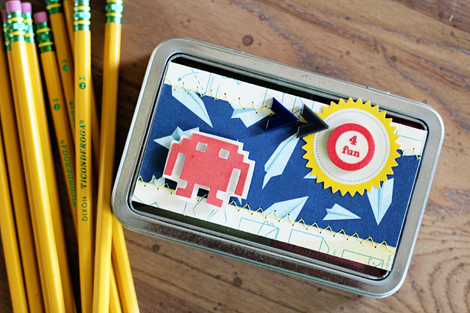 Get ready to treat your kids or teachers with these cute gift boxes. They will surely love them. But, don't forget to have fun along the way! 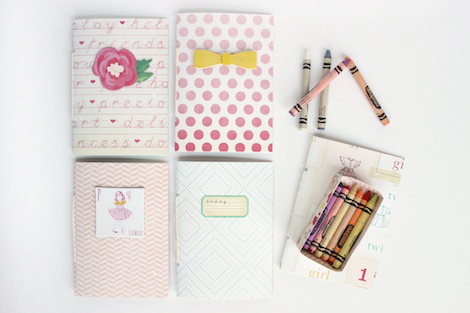 Simple journals are more popular than ever, so why not consider making a set or two for the upcoming school year? CP Gal, Stephanie Bryan, came up with the idea to create a few for the new kindergartner in her family, perfect for learning the ABC's and more! My daughter started kindergarten this year and one thing they are really focusing on at school is writing and drawing. They also encourage a lot of practice at home on their own so I decided to create a writing box for her to use whenever she has some free time. This box came together so easily and I see us creating more and more mini journals as she fills these up. The books are roughly 4" wide by 6" tall and are bound together with some kitchen twine. 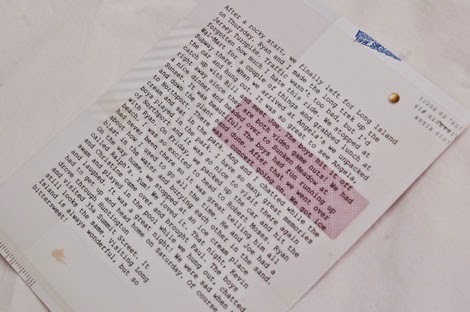 I used regular printer paper for the insides of the book because it is thinner, easy to write on and is inexpensive. I kept the fronts of the books very clean and simple by adding on a few 'little' embellishments and stickers. I also created a small box from a piece of scrap paper to hold her crayons and to keep them from rolling around inside the box. My daughter loves her writing box and I love to see her using it! Where I live, it's almost back-to-school season, and that means all sorts of things for my little girl like new clothes, notebooks and pencils, a new routine, a new grade level, and of course a new lunchbox. With her in mind and this fun time of year, I've create a few lunchbox love notes to include with her peanut butter and jelly for the first few days of school. 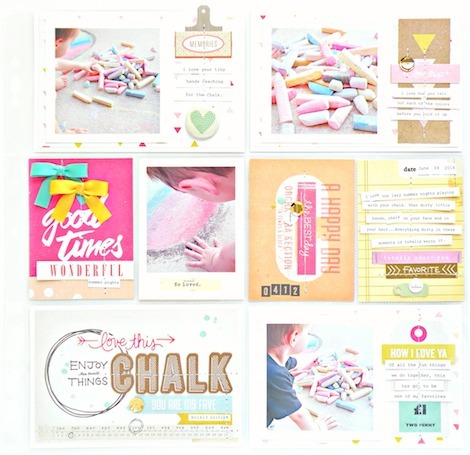 The Oh Darling collection is the perfect mix of colors, patterns, embellishments, and phrases for a project like this, but if you've got a little guy who is ready to head back to school, Crate Paper's Boys Rule will most definitely come in handy! I began each card with a white card base. I love starting a card this way because I love watching the colors and patterns pop as I start layering them. My first card doesn't contain a scrap of paper, I let the die cuts, Wood Veneer piece, cardstock stickers, and layered StandOut stickers do all of the work. Creating with layers is something I love doing because it makes me want to touch and explore my card when it's complete and hopefully the recipient will feel the same way. I used a bit of paper from the Oh Darling 6x6 Paper Pad across the bottom of this card followed by a die cut file folder. I then started layering coordinating items on top. Items such as a snippet/phrase cut from the Cardstock Cut-Out sheet, a chipboard banner, a layered paper flower, and a cardstock sticker. 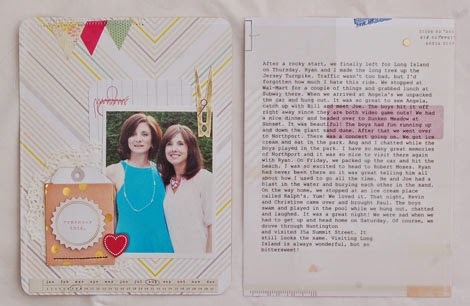 Lastly, I began this card with a Photo Overlay that extends off the left edge of my card a bit. I love the softness overlays add. I then layered a chipboard shape with two Photo Overlays creating a frame around the sweet image of the little girl. I stapled these directly to my card and then added a few more layers on top. The Wood Veneer pieces are some of my favorite embellishments, but I love the tiny chipboard flowers as well. Not to mention the Sweetie Banners Printed Thickers...I could never choose :). A layered die cut and one more Wood Veneer piece and this lunchbox love note is ready to share with my little one very soon. Now it's your turn. 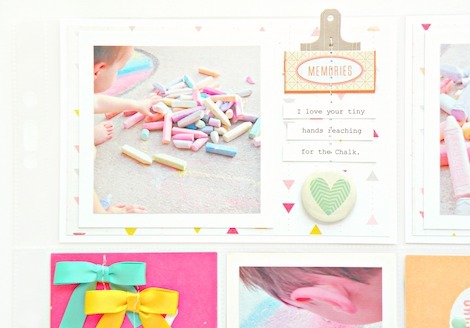 Create a few handmade notes for your new student. 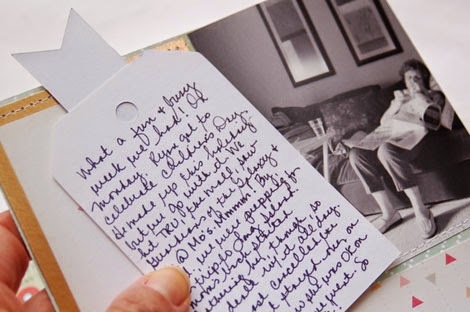 A sweet way to let them know that mom or grandma is thinking of them.